Inspired by the extraordinary success of our puck-based press contact assemblies, we have developed an equivalent for the PPMS rotator option. Based around our custom rotator sample boards, these assemblies offer the same ease of sample mounting and exchange as the puck assemblies in a smaller form factor suitable for mounting onto the rotator. Samples up to 10 × 10 mm in size and from 1 mm to 3 mm in thickness can be accommodated as standard. Optionally, samples from 0 mm to 1 mm in thickness can be supported. 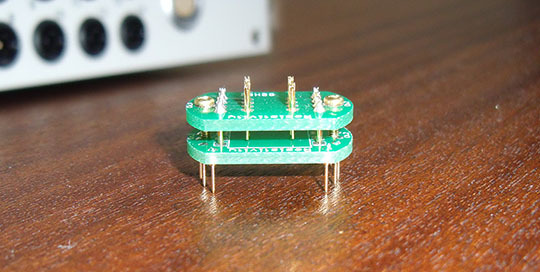 The present design features both measurement channels broken out to linear arrays of contact pins with a 2 mm spacing. As with the puck assemblies, custom designs can also be fabricated — simply contact us with your requirements. Note that, unlike the sample puck press contact assemblies, the rotator assemblies do not feature replaceable probe tips due to their small size, and are generally significantly less robust than their larger counterparts. While they should survive many measurements, they must be viewed as intrinsically consumable items. A small cross-head screwdriver is the only tool required for sample mounting.